I originally visited Taverna Gorgona in early 2009 and did not have a very good experience. In fact, all my previous visits were inconsistent. 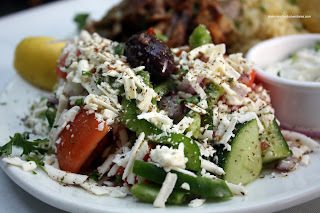 What made it really bad the last time I dined there was the nice mold in my Greek Salad. Yup, that would destroy anyone's enthusiasm. Well, as of December 2009, Taverna Gorgano is under new ownership complete with new kitchen staff. The new owner, Franco, contacted me with concerns about my post since it really didn't paint a great picture of the restaurant. No kidding... Mold in food, not a great endorsement indeed. In light of the changes made at the restaurant, I was willin g to put up a note stating the place was under new ownership and I would revisit in the new year. With a meeting in Ladner today, I thought "might as well". So I tried to replicate exactly what I did last time. I went at lunch around the same time. I sat in the same seat and ordered the same dish, which was Roast Lamb. 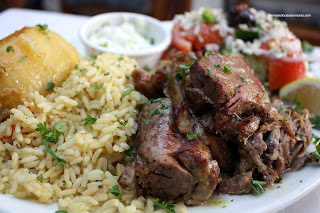 The last time, not only was the salad moldy (it also was drenched in balsamic, a no no), the lamb was dry and flavourless while the rice was wet. I was eager to see if there would be any noticeable differences in the food. When the plate a rrived, I immediately knew that there were indeed changes. First, the salad was extremely fresh and not doused in balsamic. Second, the rice was not water-logged. 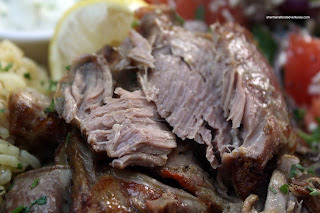 Third, the lamb was very tender and well-seasoned with lots of garlic flavour. I also enjoyed the Tzatziki very much. A bit chunky, with cucumbers and garlic, it was flavourful and thick. Moreover, the lemon potato was delicious being tart and soft while retaining its shape. This dish was like day and night over the last time. If an entire roast lamb dinner was not enough for lunch, Franco brought me his own mothers' hand made Spanakopita. The thing was enormous! 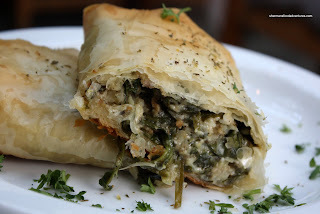 The phyllo was prefectly crispy on the outside and it encased a massive amount of spinach, feta and onions. I really liked that the spinach was fresh; rather than frozen. I could really tell in the texture and taste. This was one of the most flavourful Spanakopitas I've ever had with big hits of feta, onion and pepper. There was supposed to be dill in it too; but I really didn't taste it much since the onion and pepper taste overwhelmed everything else. This may mean different things to different people. I personally loved it; however, I can see some people preferring a less intense filling. If that wasn't enough, Franco was gracious enough to also bring a slice of Ekmek. 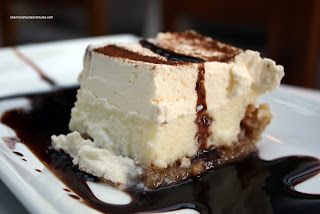 I've had many Greek desserts before; yet never this one. It's essentially a custard cake consisting of Kataifi pastry on the bottom, custard in the middle and whipped cream on the top. A thick, sweet syrup finishes off the dish. Despite looking like a sugar shocker, the Ekmek was pleasantly light. The syrup itself was quite rich and almost tasted like burnt caramel. I gotta say that I was impressed with the changes at Taverna Gorgona. At the very end, Franco wouldn't let me pay for the meal. I really wanted to pay since I did not visit the restaurant with the intention of free food. However, he was extremely gracious and appreciative that I came out to re-evaluate. Rest assured, I would not hesitate to come out again and gladly pay for my next series of meals. Once again, it is a good thing that revisits are done as restaurants might change. That makes me wonder... How much can Le Charcuterie change? Nah, if Salim changes, it won't be the same thing, hehehehe. Yah, you're right revisits are good. This one I felt strongly in doing because the new owner was sincere and I really thought that he deserved a chance. The original post was a bit... negative. i think you should not have let him know you were there. it more objective to see how they are in a true setting. Yah, normally I rarely identify myself if possible. However, seeing how Marco personally invited me, it was inevitable I'd have to meet him. Now with that being said, since Roast Lamb cannot be prepared in the 8 mins I waited for it, it would have made no difference if I informed them or not. I paid them a visit unannounced and they could not make any of the items better other than the Spanokopita. So unless they can miraculously roast a lamb in 8 mins, there is no difference. well, i'm glad to see it wasn't a repeat of your last visit! i want to go there just for that dessert, it looks great. the spanakopita is tempting too - i find a lot of places don't use enough seasoning. Dude, free food and it all looked great. It's hard to pass down free. Plus you got dessert! WIN! Trisha and Gary, yes, the food was good. In response to the other person "Anonymous" (isn't that always the case??? ), I wouldn't say it was good if it weren't, free or not. If they read this blog enough, much like you two do, they'd realize it would never be the case. I think I've spent enough of my own money to legitimize my opinions. Anonymous, when you carry an SLR and start taking pictures of the food, it is not that difficult to guess what you are sort of doing. The key details here are that it was disclosed that the meal wasn't paid for and the dishes aren't dishes that could have been prepared to order (or not almost).